Being “Tomato Girl” isn’t a full time job for Alainia Hagerty. She has a day job that doesn’t involve selling dozens of varieties of tomato plants grown in her Brighton, Tenn., greenhouse. But she views the online business with a national reach as a way of life. 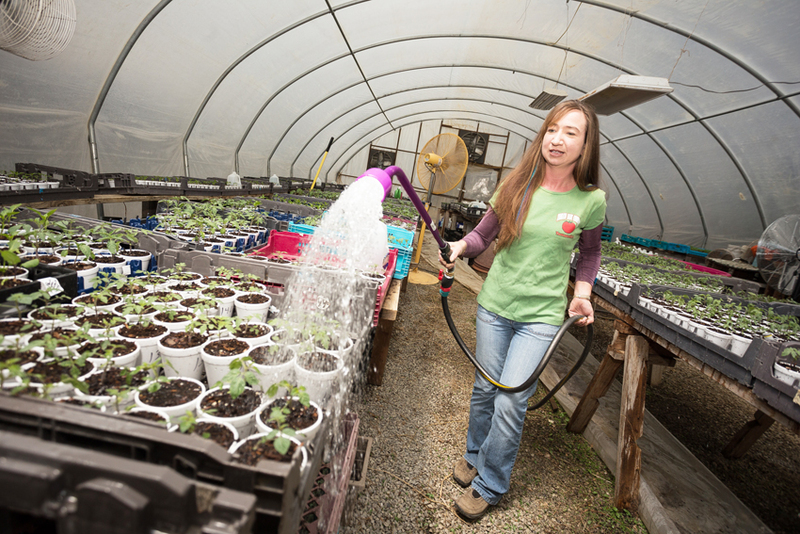 Alainia Hagerty of Tomato Baby Co. waters more than 100 different varieties of tomato plants in her Brighton greenhouse. She sells the products through her website, tomatobabycompany.com. So when the Tipton County Lawn & Garden Expo opens Saturday, April 5, at Brighton High School, another season of tomato plants and gardens – and dreams of both – will begin for Hagerty’s business, Tomato Baby Co. (tomatobabycompany.com). Hagerty’s father was an engineer-type gardener, which followed since he owned his own steel fabrication business, making steel and rubber conveyor belts. Her mother had a ceramics shop. “I grew up in self-employment,” she said. So when her father “duped” her into a tomato-growing competition in 2003 in which he didn’t grow any but offered her lots of advice, she countered by selling them on eBay and pocketing about $200. After a couple of years, she switched to a website. So she might throw in a sample of a different variety for them to try. A customer will get what they order, but they might get more based on past selections. “If they pick all reds, we have to throw some sort of color in there to just throw them off a little bit,” Hagerty said. The business model is a response to the packaging of plants at big-box stores that doesn’t necessarily encourage the real roots of gardening. Tomato Baby offers about 140 types of tomato plants as well as 36 types of pepper plants and eggplant. Hagerty has help with planting and boxing them up for delivery but otherwise tends them herself in her greenhouse. She regularly reviews what her customers are ordering with an eye toward paring down the types of tomatoes. Her plants aren’t grown organically, but she doesn’t doctor them to make the tomatoes redder or more eye-appealing – which leaves a group of “ugly babies” at the end of the season that Hagerty sends out in sample boxes. One of those boxes wound up at The White House last year, and Hagerty got a note from President Barack Obama thanking her for them.